A new passenger-cargo liner, the "New Golden Bridge VII", set off on its maiden voyage from Weihai Port of Shandong province to Incheon Port of South Korea on Sept 16. The launch of the liner is part of a big drive to promote the implementation of the Belt and Road Initiative in Weihai and open a new era of Sino-Korea friendship. Furthermore, it is being seen as a move to boost the local economy of Weihai and the construction of the China-Korea cooperative demonstration area in the China Korea Free Trade Area. The "Golden Bridge" liner has a profound origin with the Weihai-Incheon route. The original "Golden Bridge" passenger ferry took the lead in sailing the first Weihai-Incheon passenger and cargo liner route, 28 years to the day before the launch of the "New Golden Bridge VII", on Sept 16, 1990. Since the opening of the Weihai-Incheon route, it has promoted the development of trade, financing and communications between Weihai and South Korea. Officials hope that the launch of the "New Golden Bridge VII" will further open up Weihai to the outside world, promote the "linkages of four ports" between Weihai and Incheon, and accelerate the pace of internationalization in the city. 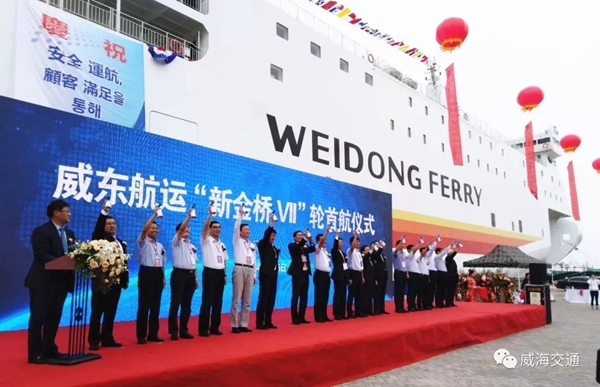 Weidong Ferry Co Ltd constructed "New Golden Bridge VII", which has a length of 196.13 meters, for the Weihai-Incheon route. The new liner departs from Weihai Port every Tuesday and Thursday and arrives at Incheon Port the next morning.